Durango’s Dawson Marcum had three rushing touchdowns in the first half to help send the Demons to a blowout win in the season opener Friday night at Pagosa Springs. Durango’s offense clicked in its first game of the season Friday night against Pagosa Springs. The Demons proved why they were ranked No. 8 in Class 3A, as they scored more points than they had offensive plays in a resounding 34-6 victory. Durango made quick work on offense and completed 30 offensive plays while scoring 34 points. The Demons scored on five of its eight possessions. 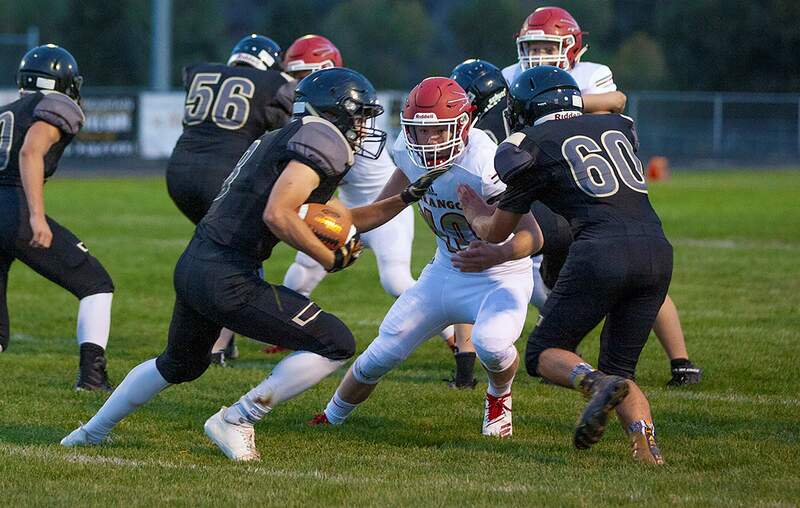 Maybe the most impressive performance was from senior running back Dawson Marcum, who scored three times in the first half in a dominant performance, including touchdown runs of 5, 21 and a 99-yard score. Marcum stole the show and opened the flood gates for the Demons. Head coach David Vogt credited Marcum for his offseason preparations in the weight room and on the practice field. Durango’s Jordan Woolverton threw 2 TD passes in Friday’s season-opening win at Pagosa Springs. Marcum got the Demons on the board with a 21-yard score after Pagosa was forced into a three-and-out on its first possession. While the offense got the much-deserved attention, it was Durango’s defense who stifled the Pirates early. In its second series of the game, Pagosa Springs had a 13-play drive that brought them within inches of tying the game at seven a piece. However, on fourth-and-goal, the Demons defense held and stuffed Pagosa Springs senior quarterback Cade Cowan at the line. “We always preach that it’s big to make goal-line stands and are able to do that, so I was super proud of the defense and the effort they put forth,” Vogt said. 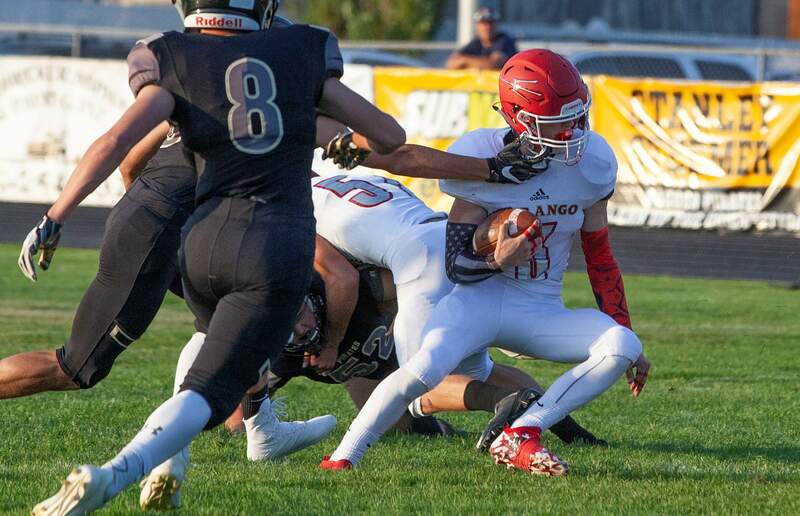 The ensuing play was when Marcum made a name for himself with a stunning 99-yard score that put all the momentum squarely on the Durango offense’s shoulders. Marcum added another score from five yards out to give the Demons a comfortable lead. 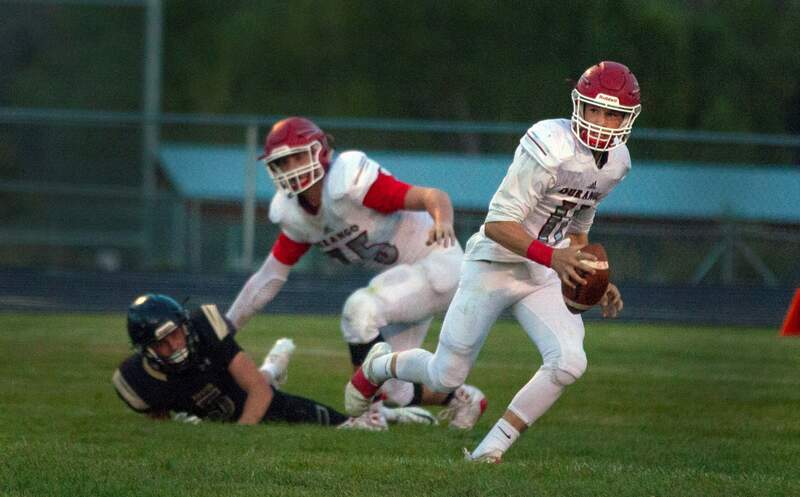 The icing on the cake was Woolverton’s arm, as he threw a 56-yard touchdown pass to Breyton Jackson to make it 27-0 midway through the second quarter. The Pirates finally got on the board after a long eight-play, 71-yard drive capped off by a Paden Bailey one-yard score with 16 seconds remaining in the first half. Durango freshman safety Jordan Stanley eyes Pagosa Springs running back Paden Bailey during Friday’s season opener in Pagosa Springs. The Demons took a commanding 27-6 lead into the halftime break and did not look back. In the second half, Durango got off to an eerily quick start. Woolverton threw his second touchdown of the game after fellow sophomore Gage Mestas caught a 21-yard pass from the quarterback. The score capped a four-play drive taking 1 minute, 15 seconds off the clock, to make it 34-6. Woolverton’s second touchdown pass would be enough for Vogt, as he barely touched the ball in the second half. He completed seven snaps before eventually being taken out after the game was decided. Jordan Stanley, a freshman, came in for the final five minutes of the game. The second half was more about making adjustments and getting in the less-experienced varsity players, according to Vogt. He added that the bus ride home would be extra sweet after the first win of the season. Durango will square off in a top-10 battle with a trip to No. 5 Palisade next Thursday night.